Having an EHR is not just being able to merely document patient encounters and bill for them. The real value of an EHR is what can you do with all the data put into it. The returned data has to be meaningful to the provider and not just in the framework of billing and RVU productivity. So one of the things that NOSH can do well is to simply query the database; the layout of NOSH’s exclusively simple database schema allows a NOSH user to able to glance in a patient’s chart or for the entire practice a snapshot of HEDIS, short for Healthcare Effectiveness Data and Information Set. HEDIS core measures are generally being used by insurance companies to determine effectiveness of healthcare outcomes for their patient panel. Although I hesitate to fully endorse HEDIS because of my concerns about the potential conflict of interest of NCQA (the agency that developed the HEDIS core measures) and its association with managed care companies, I do feel that in the absence of any alternative health care effectiveness measurement system or criteria, HEDIS at least has published and relatively clear definitions of what these measures entail and how it gets measured (which makes my software coding job much easier). And hence, I’ve included a HEDIS audit functionality in NOSH so that if you were a provider trying to track down effective interventions in your practice panel, then it can be done. It probably won’t be endorsed by NCQA, but at least some built in tool that is simple to use rather than doing your own complicated search queries in your EHR, including NOSH, can be a powerful method to help improve patient care, especially in primary care. HEDIS, being targeted to the managed care industry, has a very different aim than that of a stand alone primary care clinic. In particular, the set of HEDIS measures that is specific and helpful for primary care clinics is the domain of care that is defined as “Effectiveness of Care”. This is what NOSH aims to measure. The current implementation of HEDIS is also problematic for providers in that there is a very poor feedback loop to identify patients or encounters that fail to meet the core measurement standards. All the data is going to the insurance companies and the end result is typically rewards (or lack thereof) for pay-for-performance programs. Money aside, most providers (I think) would rather like to know what needs to be rectified to meet these measurements in the future. The problem is, most providers find that getting feedback data is difficult to understand and then on top of that, how do you target those deficiencies to improve them? What’s the point of measuring if it doesn’t help to prevent future issues or negative outcomes? 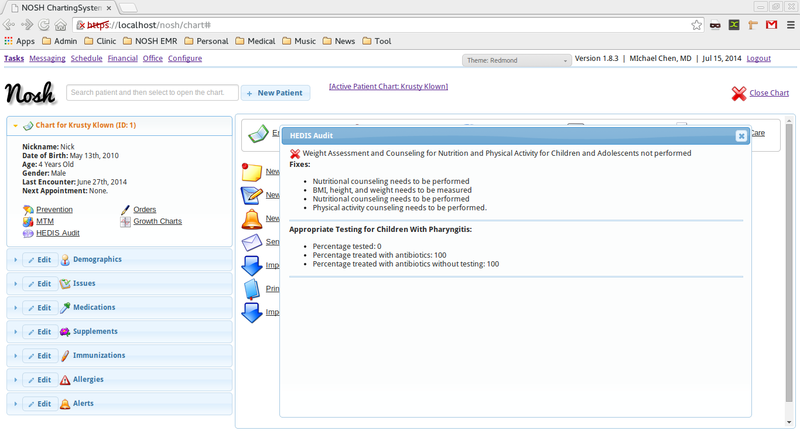 It’s tedious and very old school and certainly not provider friendly (sounds like most EHR’s to…doesn’t it?). Can’t we do better? 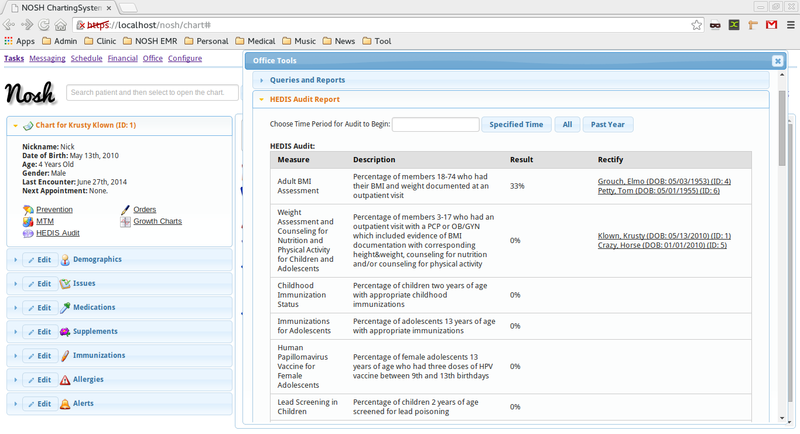 So here’s my answer and it comes in the form of a NOSH functionality called a HEDIS audit. And NOSH won’t berate you or barrage you with a whole bunch of multi-colored alerts and flashing lights, or prohibit you from doing something because you didn’t meet all the HEDIS core measures. 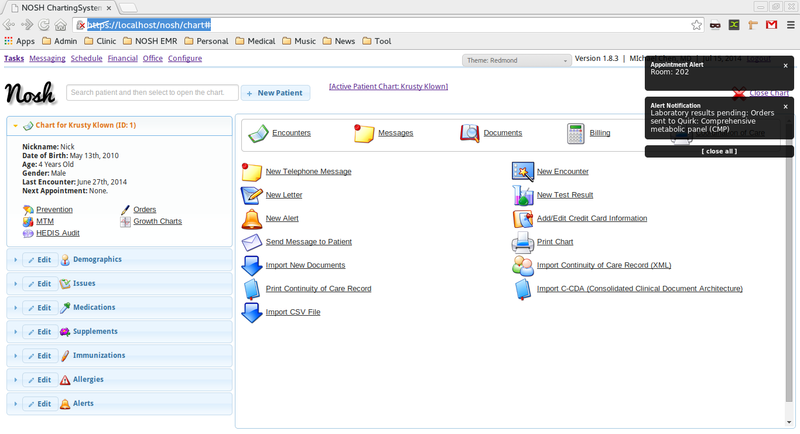 All you see is a HEDIS Audit link in the left hand side…one click is all you need to get the information that you need, so you can do your job (and mine as well), which is taking care of patients and doing it well. Just like the patient portal and online scheduling features, NOSH does this in an intuitive, non-intrusive, and simple approach that is user-friendly without information overload for the provider. NOSH doesn’t need clunky third-party services that may or may not fully integrate with the EHR to get the data return that you need. And best of all, you can use the fully featured live demo to try it out. So I urge you to check it out for yourself on the fully featured live demo. And if you’re looking for a no-hardware-hassle solution, check out NOSH in the cloud. It’s always up-to-date with all the NOSH goodness.